The centralization of the food industry, particularly meat production, means there are fewer slaughterhouses than ever. Vox looks into why this decline correlates with rapid, massive outbreaks of contamination. On the heels of the gut-wrenching news that 1.8 million pounds of ground beef have been recalled due to E. coli contamination, Vox takes a closer look at what causes outbreaks like these to become so widespread, so quickly. A key takeaway: The centralization of the food industry has enabled the rapid, massive spread of disease. There are now only four companies in the United States that slaughter 80% of our domestic cattle; consequently, the number of slaughterhouses has dipped significantly, despite the fact that we’re killing more cows than ever. The above infographic, via Vox, illustrates this tremendous drop over time (from 10,000 in 1967 to 3,000 in 2010). The result of this decline as it pertains to the spread of disease? Simply put, there is now less margin for error. One incident of contamination can impact an increased number of cows with greater ease and speed. 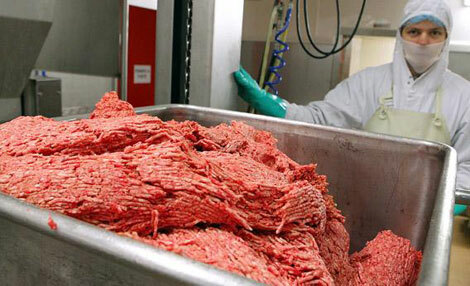 Moreover, ground beef is composed of many different meat scraps, thus increasing the potential reach for bad microbes exponentially (sobering fact: one single patty can incorporate beef sourced from several different companies). Lest we continue to be the bearer of bad news, we encourage you to head over to Vox to read more about the potentially disastrous consequences of large-scale food production and centralization. Digest in good health, please.